Google continues to sell through plenty of stock of its new Nexus family at an impressive rate. 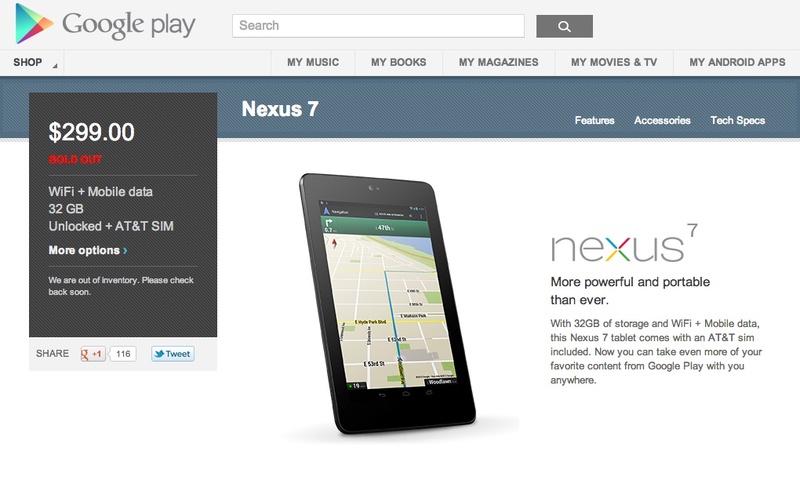 After seeing the Nexus 4 and Nexus 10 (16GB still available) sell out in minutes, it shouldn’t surprise anyone that the new Nexus 7 with HSPA+ has sold out as well. With 32GB of storage, at a low $299 price, and having the ability to connect to GSM networks across the globe, this is one of the more attractive tablets on the market. If you were considering this tablet or any of the other new Nexus offerings that are no longer in stock, Google says that you’ll have to wait a few weeks before they can replenish stock. Once they do, you better have your credit cards ready, as I’m sure they will be flying off virtual store shelves, once again.